When it comes to deep sea fishing in Cape Canaveral, Florida, there’s plenty of fish in the sea! Here’s a look into what you’ll catch out on the open ocean. The kingfish or king mackerel is just one of the exhilarating catches you’ll find deep sea fishing in Cape Canaveral. A medium-sized fish, this migratory species weighs up to 90 lbs! Its entire body is covered with very small, barely visible, loosely attached scales. The kingfish is olive in color that fades to white on its belly. With large, cutting-edged teeth, this opportunistic carnivore prefers squid, so be sure to stock up on that bait! Weighing in at almost 172 lbs, the cobia is a major Florida deep sea fishing haul. The body of the cobia is smooth with small scales and dark brown in color. Fibrous teeth line the jaws, tongue, and roof of the mouth of this carnivorous fish, perfect for feeding on crabs, squid, and other fish. The cobia follows larger animals such as sharks, turtles, and manta rays to scavenge for a little extra food. This fish is naturally curious and shows little fear of boats, so dropping your line in the waters of Cape Canaveral is almost a guaranteed catch! The name mahi mahi means “very strong”, and this fish is aptly named. One of the most sought after gamefish, the mahi mahi is a surface-dwelling fish that weighs up to 40 lbs. Distinguished by their dazzling colors of golden on the sides and bright blues and greens on the sides and back, it's no wonder these fish are caught for their beauty. Mahi mahi are carnivorous, feeding on flying fish, crabs, squid, mackerel, and other forage fish. They’re also attracted to Sargassum, a floating brown algae that serve as both a hiding place and a source of food. If you’re out on the ocean and see this algae stretching for miles, be sure to follow it! The sailfish is one of the ocean’s most coveted catches. Most famous for its dorsal fin known as a sail that stretches the entire length of the back and its elongated bill, the sailfish is predominantly blue to gray in color. Weighing up to 200 lbs, the sailfish is a massive catch. The sailfish feeds on the surface or at middle depths for smaller forage fish and squid, using their bill to strike and slash at their prey (but hopefully not your line). 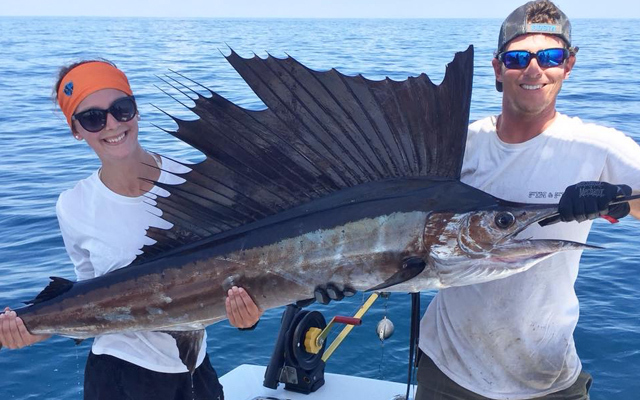 The sailfish is one of the most impressive catches you can make while deep sea fishing in Cape Canaveral. Now that you’re an expert on the types of fish you can catch deep sea fishing in Cape Canaveral, let us take you out to catch them! Book your charter online or by phone with Fin and Fly Fishing Charters today!